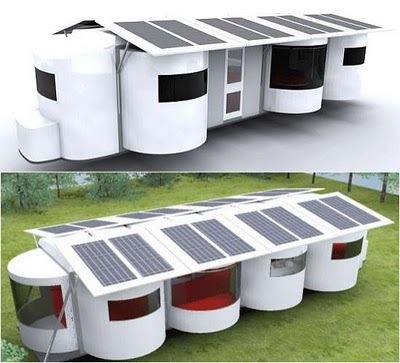 Is this what we can expect in mobile home design? 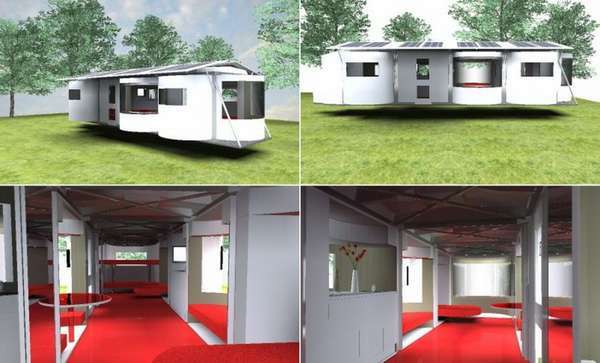 The ‘Be Coc Mobile Home’ is a mobile home design for the future. While I’m uncertain if it is to be used as an RV pull along or a permanent dwelling it still gives a good example of what we can expect from mobile home design-builders in the future. The Be Coc Mobile Home design features a bathroom, kitchen, lounge area and uses clean energy. The energy it accumulates daily is stored and can be utilized anywhere and anytime. This home is luxurious and trendy while maintaining the environment. The TrendHunter article this home was found in recognizes it as a customizable mobile home so I’m sure the buyer can choose the colors and features. I know this is only a design but perhaps it can inspire you. The use of the solar panels are very possible for a mobile home, especially the flat roofed ones. By using a lot of mirrors a mobile home looks and feels a lot larger than it really is. The tables and beds can be put up and out of the way when not in use which is a practice I think more mobile home owners could utilize. When your looking for inspiration for your mobile home updates don’t forget to look to the future and the past. There’s always something you can find that fits your taste and lifestyle.